Cover a cookie tray or large dish with wax paper. Melt the confectionary coating according to the instructions on the package. Place the melted candy in a tall glass. Dip the pretzel into the glass to cover in candy. Remove and let the excess drip back into the cup. 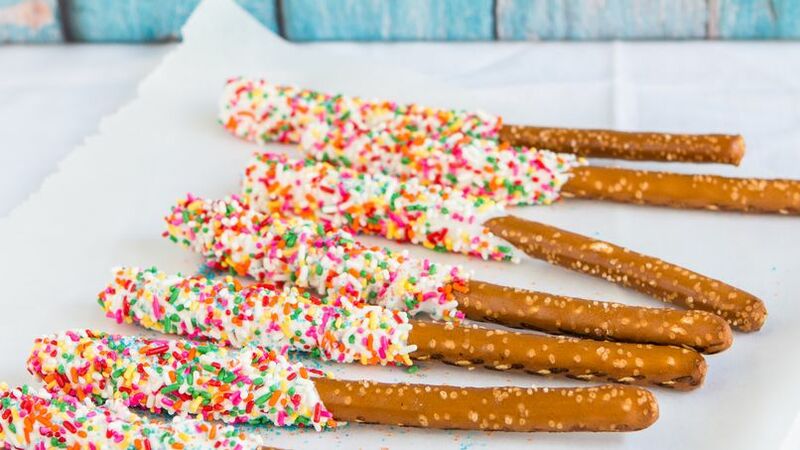 Use your fingers to add the rainbow sprinkles until it’s covered completely. Place on the prepared tray or dish. Repeat this process until you've covered all of the pretzels. Refrigerate for 5-10 minutes, or until the candy hardens. You can use chocolate sprinkles if you prefer. Cooking for my little ones is something I really enjoy. Because they're so young, I try to make quick, simple and fun meals for them. You can't imagine how much fun these pretzels were! I was in charge of the candy and they took over the sprinkles. The kitchen was a disaster and I kept finding sprinkles in unexpected places, but it was worth it! I invite you to prepare this fun recipe with your kids. This is a great way to give your Memorial Day spread a touch of color.